Illinois is a state in the United States named after the Illiniwek Indian tribe, which used to live there. The capital of Illinois is Springfield and the U.S. postal abbreviation for the state is IL. Abraham Lincoln, the 16th President of the United States, lived in Illinois from a young age, and eventually served four terms in the Illinois General Assembly. Ronald Reagan, the 40th President, was born in Tampico, Illinois. 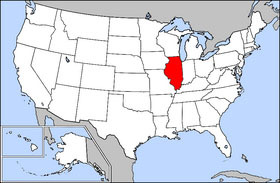 The USS Illinois was named in honor of this state. Named for the Illiniwek tribe of Native Americans, this state is known as the "Land of Lincoln," because it is where the 16th President spent his formative years. Illinois became the 21st state in 1818. Illinois Territory was created on February 3, 1809 out of the Northwest Territory. Previous to that, its lands were claimed by the Illinois-Wabash Company. The capital of the state is Springfield. The current Governor of Illinois is Rod Blagojevich (a Democrat) and the U.S. Senators are Richard J. Durbin (a Democrat) and Peter G. Fitzgerald (a Republican). Senator Fitzgerald will retire when his term ends. Currently on the ballet to replace him are Barack Obama (Democrat), Alan Keyes (Republican), Jerry Kohn (Libertarian), and Albert Franzen, an independent. Keyes was selected for the Republican ticket to replace Jack Ryan (Republican), who had withdrawn from the race. It is in the north central U.S. and borders on Lake Michigan. Surrounding states are Wisconsin to the north, Iowa and Missouri to the west, Kentucky to the south, and Indiana to the east. Illinois also borders Michigan, but only via a water boundary in Lake Michigan. The 1999 total gross state product for Illinois was $446 billion, placing it 4th in the nation. The per capita income was $32,259. Illinois' agricultural outputs are corn, soybeans, hogs, cattle, dairy products and wheat. Its industrial outputs are machinery, food processing, electrical equipment, chemical products, publishing, fabricated metal products, transportation equipment, petroleum and coal. The 2000 population of Illinois was 12,419,293. At the northern edge of the state on Lake Michigan lies Chicago, the nation's third largest city. More than half of the population lives in and around Chicago, the leading industrial and transportation center in the region. The rest of the population lives in the smaller cities and on the farms that dot the state's gently rolling plains.